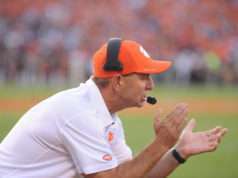 CLEMSON, S.C. – The offense produced a season-high 77 points as the No. 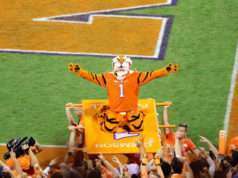 2/2 Clemson football team handled the Louisville Cardinals in a 77-16 win on Saturday at Memorial Stadium. With the win, the Tigers’ fifth straight over the Cardinals, Clemson remained undefeated at 9-0 overall and 6-0 in the ACC, while Louisville dropped to 2-7 overall and 0-6 in conference play. The run game powered Clemson offensively, accounting for 492 of its 661 total yards, as Travis Etienne, Lyn-J Dixon and Tavien Feaster each eclipsed the 100-yard rushing mark and combined for four touchdowns. 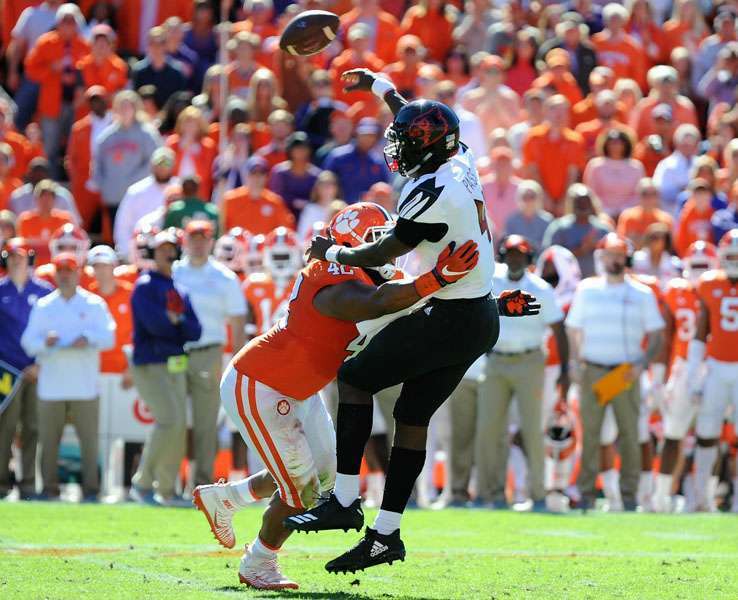 On the defensive side of the ball, Kendall Joseph led the Tigers with 10 total tackles and 1.5 of Clemson’s six sacks. Isaiah Simmons and Tanner Muse each intercepted a Cardinal pass, and Simmons returned his for a pick-six. Clemson scored the game’s first touchdown on the first drive when Etienne capped a 75-yard drive, 45 yards of which he accounted for, with a 10-yard scoring run. After forcing a Louisville three-and-out, the Tigers found the endzone again on the first play of their ensuing drive when Feaster broke away for a 70-yard touchdown run that put Clemson up 14-0 less than five minutes into the game. Louisville got on the board late in the first quarter on a 25-yard Blanton Creque field goal, putting the Tiger advantage at 14-3 at the end of the first 15 minutes. The Tigers opened scoring in the second quarter on the first play of it when Higgins hauled in an 11-yard touchdown pass from Trevor Lawrence. The next points came three minutes later in the form of the Simmons interception that the safety returned 27 yards to complete the pick-six. Clemson closed the first half with another touchdown, a three-yard completion from Lawrence to Amari Rodgers that put the Tigers up 35-3 heading into halftime. Dexter Lawrence was on the receiving end of a Trevor Lawrence handoff and powered two yards into the endzone for Clemson’s first third quarter touchdown, and the second was set up by the Muse interception on Louisville’s next drive, enabling Feaster to put the Tigers up 49-3 on his second score of the day a few plays later. Chase Brice quarterbacked the Tigers to two more third quarter scores, with one a six-yard pass to Trevion Thompson and the other a 59-yard pass to Justyn Ross. Louisville scored its first touchdown with less than a minute to go in the third quarter on a Hassan Hall 93-yard kickoff return for a score, but a blocked extra point left the score at 63-9 in favor of the Tigers after 45 minutes. For the second time in the game, the Tigers scored on the opening play of a quarter when Lyn-J Dixon kicked off the final 15 minutes with a 55-yard scoring run. The remainder of the quarter saw a Malik Cunningham 10-yard rushing score for Louisville, and an eight-yard touchdown reception by Will Swinney for the Tigers, bringing the final score to 77-16. 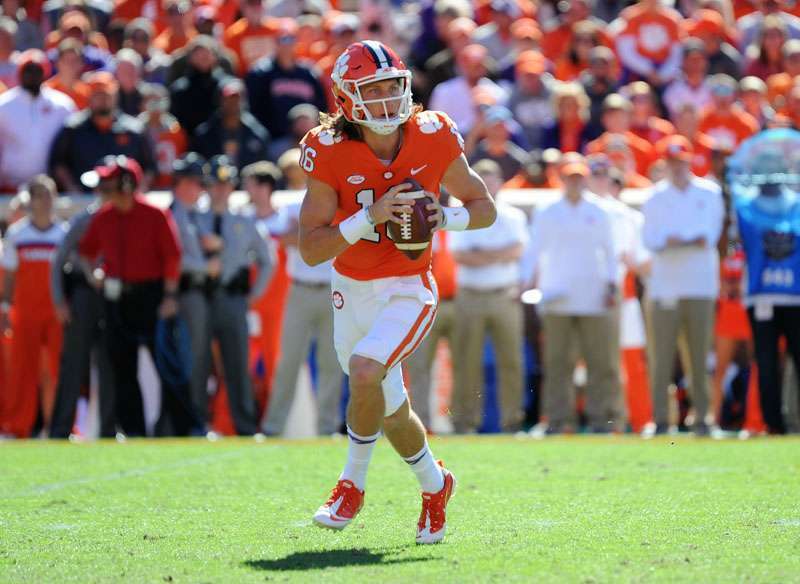 Clemson heads to Chestnut Hill, Mass. next Saturday for its final road game of the 2018 regular season, a matchup with No. 24/25 Boston College. A kickoff time against the Eagles is yet to be announced.